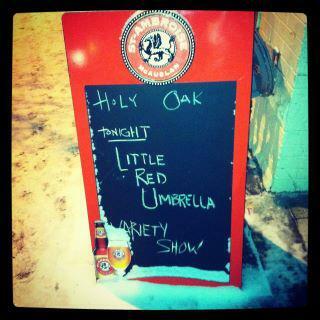 We held our second Little Red Umbrella Variety Spectacular at the Holy Oak Cafe last Friday. It was a drunkenly awesome night, with tour guy Jason Kucherawy telling stories about prohibition in Toronto, author Shaughnessy Bishop-Stall reading from his novel, Ghosted, comedian Desiree Lavoy-Dorsch, magician James Alan, music from Blood Rexdale and the Walls Are Blonde, and a set of songs from our Song You Can Dance Around Your Apartment To podcasts spun by DJ Flex Rock. 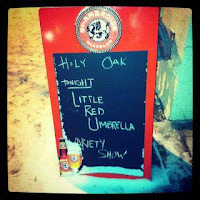 And in our ongoing attempt to make the world a better place by drinking, 10% of all the bar sales went to support the AIDS Committee of Toronto. We've posted all our photos from the night on Facebook, which you can check out (even if you don't have a Facebook account) here. And if you missed it, don't worry! We're planning on having the third one sometime this spring.